A weekly Saturday recap to share with you our favorite links, discoveries, exhibitions, and more from the past seven days. This week: Highlights from Design Week Mexico (including these graceful screens by Julie Richoz), a new direction for Pritzker Prize winner Tadao Ando, and a series of modular, millennial-friendly furniture made from metal, MDF, and — major material wild card here — resin-infused buckwheat groats. On view at Design Week Mexico earlier this month (which was delayed a week because of the earthquake) were these beautiful screens made by Swiss designer Julie Richoz while on residency with Nicolas LeMoigne at the Tadao Ando–designed Casa Wabi on the Oaxacan coast. Twice a week, for five weeks this fall, the two designers traveled to the small Michoacán town of Santa Catarina to work with local palm weavers. The screens, made from dried palm fibers and metal, are on view at Casa Wabi’s Mexico City space until November 12. Also on view in Mexico, at the Inédito exhibition at the Museo Tamayo, was the new collection by Comité de Proyectos, who were one of our favorite finds at last year’s show. Their new low Trama table was inspired by the form of Espacio Escultórico, a 1979 land art piece in the middle of Mexico City. Opening Thursday in New York at Cassina Projects is the first solo exhibition by Berlin-based artist Gerold Miller, a survey that includes Miller’s first three-dimensional works, seen above. On view this weekend in Sydney was the first edition of Design Made, a new independently run festival in the Australian capital. One of our favorite debuts was this brass, oak and smoked glass curved credenza by Sydney-based designer Jonathan West. In New York, artist Sam Moyer opened her first solo exhibition with Sean Kelly gallery, debuting a new body of work that combines hand-painted canvases with sheets of marble, slate, and stone, marrying painting and sculpture in a single piece. We’re a little early to the party on this one, but just a PSA that a retrospective of Stephen Shore, one of our favorite photographers of all time, opens November 19 at MoMA. Los Angeles ceramicist Brian Rochefort is having his first solo exhibition at Van Doren Waxter gallery in New York, showcasing 15 of his “craters” inspired by volcanic landscapes, earthen depressions, remote tropical rainforests, protected barrier reefs, and exotic animals. “Each piece begins as a large unfired work that Rochefort smashes, and sometimes breaks apart…. The works are then submerged in mud and clay — drying and cracking to build mass — and then fired over to add color and build texture, airbrushing gradients and then using glazes.” So pretty. Is Tadao Ando having a moment? This is the third time we’ve mentioned the Pritzker Prize–winning architect in the span of 48 hours. Shown here is a bit of a departure from his usual work — Ando collaborated with the glass artists at Venini to create a series of glass vessels called Cosmos, on view at Les Ateliers Courbet in New York starting November 7. In each vessel, a sphere emerges through a void, a Buddhist concept that recurs in Ando’s work. 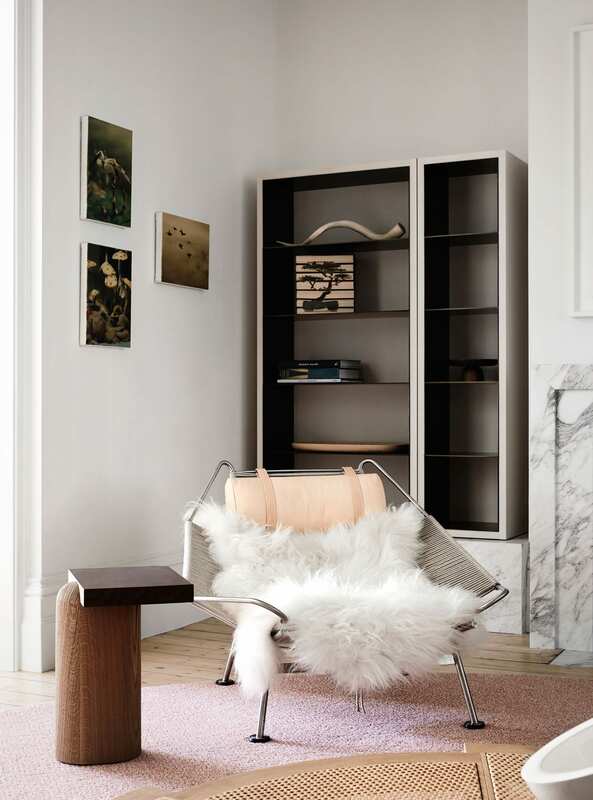 Our first inclination was to show you this vignette from an Australian interior designed by Melbourne-based designer Fiona Lynch, and maybe start an Instagram account devoted to “100+ images we love of Hans Wegner’s iconic Flag Halyard chair.” But holy smokes, that custom curved cabinet handle?! Head over to Yellowtrace for a look at the full interior (and to reignite a full-on obsession with that amazing, circular Charlotte Perriand coffee table). We’ve been championing the work of Crosby Studios since two OFFSITEs ago, so we were happy to see a profile of its founder, Harry Nuriev, in the upcoming issue of T Magazine. We were also psyched to see an unexpected shout-out in the first paragraph, as an Instagram account to follow if you’re interested in an aesthetic that revolves around: “the prevalence of brass, the ubiquitous arches and the ambient influence of the ’70s and ’80s: that era of sunken living rooms, scalloped seating and Golden Girls peaches and pinks.” Yep. (Photos © Blaine Davis). Welp, millennial pink finally made it to Poland — which makes sense considering it was three young Academy of Arts and Design students who created this collection, called Iles, aimed at millennials. “This group primarily values functional furniture. They tend to prefer minimalistic approach to the design. Millennials often change their place of residence, and that’s why they care about mobile furniture which is easy to move and reassemble.” Each piece is made from powder-coated steel pipes, MDF, and, interestingly, buckwheat groats that are mixed with resin to form a textured surface. A cute submission in our inboxes this week from the Paris-based duo Chapel Petrassi. Their colorful, Memphis-esque Bikini cabinet is our favorite, though these squiggly, anodized aluminum benches run a close second.